Well that’s that, as they say. After two years of researching, writing, and transcribing, my little history project has come to a close. Cap’s final entries from February 1919 are his last, and so my part in publishing the journal also comes to a close. Of course, Whining Past will stick around for anyone who would like to read or peruse a bit of WWI history, but my role here is done. As for the contents of this entry, Cap details his embarkation to the United States from the city of Brest, concluding more than eight months of fighting in France. He recounts sea sickness, celebration, homecoming, and an inventory of impressive steamships. He ends on a curiously brief note about the intent of his journal, which was, quite simply, to document his experiences during the war. So I got to thinking about my own intent and why I decided to transcribe and publish this journal nearly a century after it was written: Part of it was respect for history, part of it was family research, and part of it was just compulsion. These are influences that are probably not far off from what Cap was thinking when he first opened that 8.5 x 11.75-inch legal pad in June of 1918. Now I can’t help but wonder if Cap ever could have imagined how large an audience his little pencil scribblings would one day have. 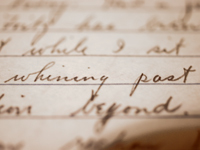 At the time of this writing, Whining Past has received more than 40,000 page views and nearly 32,000 visitors. That’s a significantly larger audience than most historical publishers could ever hope to reach with this kind of text. On one day alone last year (July 23rd), the journal received more than 18,000 views (thanks to Reddit). Now compare that to the 94 years it spent collecting dust in homes throughout Massachusetts and Connecticut, or even to that of similar primary source documents published through traditional means. The internet is a curious thing. My biggest regret is that I could not complete the project before my grandfather, John (Cap’s only child), passed away. He followed this project diligently and was always interested to hear of its progress. I wish he could have seen it complete. Still, from everything he told me while he was alive, and from what family members have relayed to me personally, he was overjoyed to see his father’s journals published in such a lasting manner. I’m proud to have contributed at least some joy to his last few years of life. Finally, to all those who have enjoyed reading about Cap’s life, thank you. History is a difficult subject, if only for the disconnect most people feel towards generations past. But I think it’s important to latch onto those referential moments whenever we find them—be it through an old journal or even just a photograph—because if we don’t respect where we come from, we’re not likely to respect where we are now, or where we’re going. And that applies to individuals as much as populations. Anyway, thanks for all your support. I hope you continue to enjoy the site. It’s been a while since our last post, but here it is: Cap’s journal entries from January 1919. By this time the war has been over for a solid two months, and the grind of post-war bureaucracy is starting to set in. Cap shows a clear anxiousness to get home, and the winter weather doesn’t seem to help. December 1918 was a somewhat tedious month for Cap, and likely the whole of the AEF. The war was over and the U.S. was busy trying to get its 2 million or so troops out of Europe. As Cap detailed in his journal entries from the time, this was no simple task. All the while, the Spanish Flu continued to wreak havoc on the continent—as well as the rest of the world. Funny that Cap didn’t seem to recognize it for what it was: one of the worst natural disasters in human history. When all was said in done, between 50 and 100 million people were dead—and that was on top of the catastrophic human toll of the war itself. I wrote an essay about Cap and my experience transcribing his journal. It can be found here. “I sat on the journal for a few months, unable to shake the feeling that I needed to do something with it. I didn’t want to hand it over to a museum or the National Archives or anything like that. This was a family emblem first, historical document second. I decided that, at the very least, it needed to be transcribed. It’s certainly fitting that this is the month that’s taken such a long time to publish. I haven’t been active on here since late April, as I had to attend to some urgent business—namely, I bought a motorcycle and have been spending too much of my free time riding it. But I digress. November 1918 was also the month Cap had a three-week lapse in writing. But the reason for his delay is a much nobler one: He was busy winning a war. He was also severely injured in a mustard gas attack that left him blind for several days. Cap’s lengthy entry from November 28 is one of the most captivating pieces of first-hand reporting I’ve ever read. It’s like the zany nightmare of a mental patient: a ruthless enemy hurling shell after shell of poisonous gas at you, who upon reaching an armistice immediately runs across the trenches to offer you wine—all this amid the silent spread of the deadly Spanish Flu. It’s something unimaginable, and quintessentially not of this era. The war continued to drag on in October of 1918, although hopes for an armistice were brewing. Negotiations between Germany and the western powers had indeed begun, but many of these hopes would be dashed as the fighting intensified and the push into German-occupied Belgium continued. In one illuminating entry on October 9, Cap references a famous quote by General Sherman (of Civil War fame): “War is Hell.” It seems the one certainty in the depths of this horrendous conflict. I’ve also updated the photo collection. It’s truly fascinating just how well documented World War I was—the sheer volume of photographs and first-hand accounts that exist in varying degrees of decay.